"Being different is painful. Nobody knows that better than me." Director Phil Weinstein has handled a number of straight-to-video and television rehashes of popular animated Disney films, like Aladdin and Hercules. As a rule, the budget is a fraction of the original, and as a result the animation is mediocre, at best. 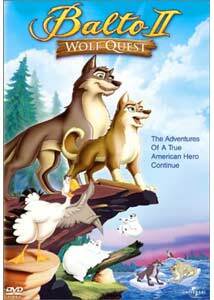 With Weinstein's Balto II: Wolf Quest serving as a similar type of followup to the 1995 animated feature Balto, the bar is lowered once again.Dev Ross, writer of a handful of The Land Before Time sequels, tosses out a well-meaning screenplay that conveys that ever important message of finding one's true destiny. Like Balto, this tale is also set in the rough and rugged Alaskan wilderness. Half-wolf, half-husky Balto (Maurice "The Brain" LaMarche), who struggled with his own self-worth in the original, here has fathered a litter of pups with purebred husky Jenna (Jodi Little Mermaid Benson). All of the pups look like huskies except Aleu (Lacey Chabert), who resembles a wolf (just like her old man). When Aleu isn't adopted by humans like her siblings, due to her inherent wolfiness, Balto is forced to explain to her their misunderstood family heritage. Young Aleu then runs away, and the remainder of this 76 minute film combines Balto's search for his daughter, as well as her own personal trek to discover who she really is. You know, destiny.A subplot about Balto's mysterious and troubling nightmares, ripe with Native American symbolism, eventually surfaces as the key to the story's conflict. Some of the totem pole imagery, and the subsequent "visions" that Balto encounters, have a weird peyote-induced feel to them, and could be a tad spooky for some wee ones.The problem overall is the animation, which suffers from an obvious stiffness and a lack of natural fluidity that no doubt comes more from budgetary constraints than talent. Colors look very bright, and a few sequences have the potential for nice-looking imagery that is marred when the characters actually move. However, the scene where Aleu encounters mystical field mouse Maru (Peter MacNicol) does manage to generate what is probably the film's strongest moment. Aleu is drawn into some type of Native American-inspired animal constellation dream scenario that is some of the better, and most creative, animation in Balto II: Wolf Quest.If you put on your straight-to-video goggles, you might be able to look past the static animation and pull out a couple of worthwhile moments. The film's message is nice, and a stable of strong voice talent (LaMarche, Benson, Chabert, David Carradine) do their best. Image Transfer Review: Balto II: Wolf Quest is presented in a 1.33:1 full-frame aspect ratio, which is not surprising considering it is a straight-to-video product. Colors are rich, and provide nice depth and detail in the animation. Some of the night sky sequences in particular look very natural. Black levels are solid, as is contrast. The source material had a couple of minor blemishes, but overall the print is clean.A nice looking, though cheaply animated transfer. Audio Transfer Review: Universal has issued this disc with 5.1 Dolby Digital mixes in both English and Spanish. What this film lacks in high-quality animation is made up with a well-mixed audio track that has a strong dynamic range, and refreshingly pronounced bass rumble, most notable during some of the musical passages that feature some psuedo-Native American percussion. All of the dialogue is cleanly spread across the fronts, with decent separation. Rears are reserved for occasional ambient sound cues (like the ever present and ominous raven) that give the sound field a bit of added depth.A French 2.0 surround mix is also included. 1 Other Trailer(s) featuring E.T. Extras Review: Are these extras or promotional items? Also included is a commercial for a Fisher-Price PC game (Rescue Heroes), a couple of trailers (including one for the re-release of E.T. ), as well as DVD-ROM extras that feature Universal websites links and a demo of the Rescue Heroes game.Only a lifeless game called Rescue Aleu that requires using the remote to move the wolf/dog across a series of ice blocks to safety seems to qualify as "extra," but it doesn't offer much in the way of repeat play value. Nice message. Short runtime. Nice 5.1 mix. The voices of Lacey Chabert and Jodi Benson. Weak animation. Four out of five things are OK, just not great.Try it as a rental for the under 7 set, but you may want to brush up on your totem pole lingo to explain a few things to the curious.